The fun of IKEA is the endless options for mix and match items to truly make your home or apartment yours. It’s true for an office too. While it’s fun to get lost in the maze of cabinets, shelves and little things to sit on those shelves, it can get difficult to imagine how they will look in your rooms. The stores offer some software stands to ‘build’ a room but who has time to layout the room exactly as you like standing at the kiosk. Now, we have an option to set up a room on the iPad without buying too big of a cabinet or breaking our backs moving things around… and around… and around. 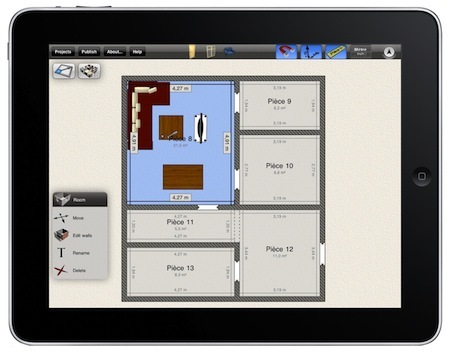 Home Design 3D has moved their PC software to the iPad. 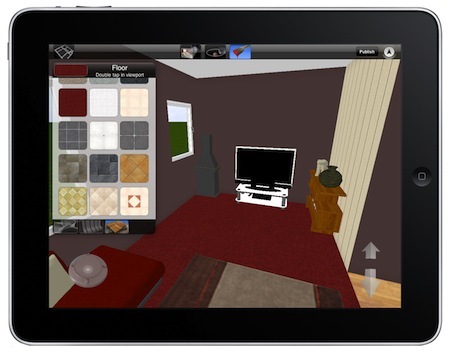 Set up a room in 2D or 3D, color walls, choose from 150 furniture items, and then start playing with your ideas. The IKEA furniture catalog isn’t included in the selection to use in the Home Design 3D app but there are plenty of items of similar size to use. By setting the room size and shape, as well adding anything not movable before going to the store means more fun at the store. When at the store, find something you like, then add a similar item to your room on the iPad. Size matters in a room layout so you will know if it actually fits with other objects, and since your in the store you can visualize the room in 3D and the cabinet in front of you.